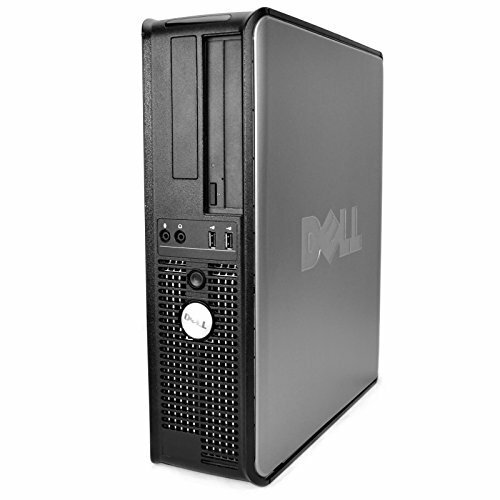 The Dell OptiPlex 780 is a Small Form Factor (SFF) PC designed for small business or home users. It doesn’t have much room for internal expansion but, but even with its diminutive stature, it gets the job done, and won’t take much desk space. Its design blends pretty well with any modern work space, and it can equally sit at home next to a flat display panel. This PC provides just enough power for anyone on a budget, but in need of a basic SFF for daily computing tasks. You could, as well, get away with servicing it on your own, since a pair of latches open to the inside. On the front, it has a pair of USB ports and microphone/headphone jacks in addition to the optical drive. Depending on the available space on your desk, you can either place the OptiPlex 780 horizontally or vertically; you can also swivel the Dell logo on the front to match the orientation you choose. The OptiPlex 780 is a tiny PC, measuring 4.5 by 13.9 by 4.5 inches (HWD). This is slightly bigger than the Dell OptiPlex 5050, but a lot smaller than the average business tower. Yet, it holds a slimline optical drive, a floppy drive and hard drive on the inside, which are two pluses making it easier for servicing by your IT folks. Around the back are serial, parallel and D-sub ports but it doesn’t have a PS/2 connection. There are more ports here: six USB ports, Ethernet, and microphone/headphone jacks. If needed, you can configure the system with a DVI-add-on card via a PCI Express x16 slot. Either of these display connections can be used for dual-monitor configurations, though you can’t use all three simultaneously. Our review unit is configured with an Intel Core 2 Duo 2.9GHz E7500 Processor, 4GB Memory, 160GB Hard Drive and Intel Graphics Media Accelerator 4500. It uses 802.11G wireless protocol for connecting to the internet. With this configuration, the OptiPlex 780 delivers on daily computing tasks like basic media encoding, MS Office processing and browsing the web. Still, it won’t suffice for complex tasks like multiple browser tabs and gaming here is a never. That was expected, since you’re only paying for a basic home-use PC, that means you’ll only be getting the same level of performance. Power consumption is very frugal, as the system uses only 38W when idle and 74W when all cores are being utilized. The Dell OptiPlex 780 deserves honors for its admirable SFF design and very pocket-friendly pricing. For a small home/office or large corporation deploying hundreds of PCs for basic office use, this might be the right choice. While not perfect, it’s a neater and more affordable solution than the ones we’ve seen in the past. Its performance doesn’t come any close to modern SFF like the Dell OptiPlex K3T2W, but it’s one of the best budget business PC implementations out here. The Dell OptiPlex 780 is a budget SFF PC that fits almost anywhere, making it an excellent choice for large corporations deploying an army of tiny desktops or a small home office that needs a basic desktop PC.